View More In Postal Scales. 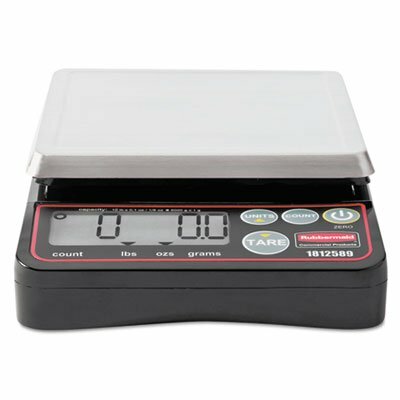 Ten-pound capacity compact digital scale is perfect for smaller kitchens or when you need quick measurements on the move. Scale displays in ounces and pounds in fractional, decimal and whole grams. Antibacterial protection on resin surfaces to help prevent cross-contamination. Programmable auto shutoff to conserve battery life. Scale Type: Portion Control; Electronic/Mechanical: Electronic; Increments: 0.1 oz, 1/8 oz,1 g; Power Source(s): AC Adapter (included); AAA Batteries (sold separately). Scale displays in ounces and pounds in fractional, decimal and whole grams. Ten-pound capacity compact digital scale is perfect for smaller kitchens or when you need quick measurements on the move. Antibacterial protection on resin surfaces to help prevent cross-contamination. Programmable auto shutoff to conserve battery life. Can calibrate in the field. If you have any questions about this product by Pelouze, contact us by completing and submitting the form below. If you are looking for a specif part number, please include it with your message. o Pelouze Manufacturing Company o - Monarch Scale, 50 lb. By 2 oz., 6-1/2"x6-1/2"x8-1/2"